Other genres treat it as the norm but why do we get so riled by the idea of DJs working with producers? The truth is, it’s complicated. Few subjects in dance music arouse anger quite like ghost production. The producers who work anonymously in the shadows creating and remodelling music that will eventually see the light of day under someone else’s name are the often scorned black sheep of the scene. The DJs who use them deny their involvement. If you scan the Discogs entry for a track that features the work of a ghost producer, it’s highly likely all credit will go to the artist whose name the music has been released under. Just the name alone implies that the ghost producer is dance music’s very own modern day pariah. But what exactly is ghost production? It’s a term that has been popularised by the advent of EDM. The meaning varies and can describe the practice of buying a track made by someone else for release under a different name. Or it can mean the process of using an engineer to co-write a track with. It’s a murky area of dance music complicated by a pressurised industry that requires artists to tour relentlessly and release music relentlessly. Few are able to do both to a consistently high level and that’s where the ghost producers step in. In other forms of music, the process of having a producer and musicians create or work on a piece of music for an artist is unquestioned. Look up the Discogs entry for a Radiohead album, and from mix engineers and musicians, to the producer and band themselves, you’ll find the full cast of people who worked on it all there, present and correct. Like celebrated producer George Martin who also played on The Beatles’ records, Godrich also creates “noises, textures, and atmospherics” as well as overseeing the production of the album. When Nile Rodgers heard David Bowie’s first version of ‘Let’s Dance,’ it was an acoustic folk version of the song that was radically different to the era defining classic it had yet to become. Rodgers input was massive. He rewrote the guitar hook, and injected the knowledge gained from writing a slew of dance music hits with Chic into creating a disco infused powerhouse of a track that went onto breathe a new lease of life into Bowie’s career. Unlike many dance music productions of a similarly complicated nature, Rodgers’ involvement in the track is credited and in plain sight on the song’s Discogs page but David Bowie’s name is ultimately the one on the track title. Stretching back into the 18th Century, even Mozart ghost wrote classical compositions for wealthy patrons. So why is the use of a producer or engineer such a taboo subject in dance music? Part of it can be attributed to how technology has democratised the music creation process. Unlike a song like ‘Let’s Dance,’ which required multiple musicians, studios, producers and engineers to finish, modern-day dance music is often made by one producer, often on a laptop with little more than a keyboard controller, a copy of Ableton Live and some monitor speakers for company. On the surface, there is no excuse for not being able to make your own tracks, but while the cost of the technology has been drastically reduced, the knowledge requirements for every step of the process of making high quality music still require decades worth of experience to obtain. Anyone who has ever interrupted the flow of a track to fret over the compression of a snare drum and killed the creative spark in the process can agree that it’s an incredibly difficult process to play every role in the creation of a song to your best ability. Sometimes, the artist needs to be the artist and worry about the bigger ideas and the engineer needs to engineer and toil over the finer details. Timo Maas is one such artist who fully discloses his work with engineers. Over the course of his career, he was worked with a string of producers, most famously, Martin Buttrich in the early 2000s and is unafraid to discuss his role in the process. His involvement in the creation of a track is like a movie director brainstorming the big ideas and the overall feel and vibe, while his engineer works on the technicalities of how to realise Timo’s vision. There are countless other examples of well known DJs working with producers. Would Goldie’s seminal album ‘Timeless’ have been the same without the input of Rob Playford or 4Hero’s Marc Mac? Or Sasha’s ‘Xpander’ or ‘Scorchio’ without Charlie May? In the interests of disclosure, it’s important that I mention that I work as an engineer. I know plenty of DJs who I believe needlessly shroud the involvement of engineers in their tracks in secrecy. I’ve heard plenty of rumours of well known artists working with engineers whispered like it’s a shameful secret. While I have never written a track for an artist without using any original material by them, I help finish loops and mix their tracks and see absolutely no harm in an artist’s name being used on songs I have worked on, so long as I am properly credited and compensated for my work. How can I justify allowing someone else to pass off my work as theirs? In practice I don’t see it that way. 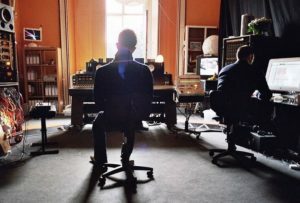 Music is a collaborative process, whether its between the solo producer and their machines, or the lengthy cast of people who work on a Radiohead album. The waters are muddy, particularly in electronic music; a genre that relies heavily on sampling, sequencers and modular synthesis. Of course there are situations where people play no part whatsoever in the creation of music they later claim credit for. That is not a situation I’ve ever been involved in, but I wholeheartedly agree, it’s wrong for an artist to claim a track as their own that has not featured any input from them whatsoever. This is the area of ghostwriting that most critics jump to assume is the case when the subject of ghostwriting comes up. In reality, the nature of ghostwriting varies from song to song. Sometimes it can involve finishing a loop of elements created by the client and adding additional production and arranging. Sometimes ghost writers take instruction from a client on how a track should sound. They are sent music by other artists with notes that may request a similar bassline to one song or a similar sounding pad from another. As the track progresses, they listen to it at different stages, requesting changes or suggesting further ideas. The final result is often a track that is very different to that which the producer might compose themselves or even the songs containing the parts that inspired it in the first place. In delivering this set of instructions, the artist is still playing a part in the tracks’ creation by defining a vision of how it should ultimately sound and it’s a situation similar to countless records made in this way since the beginning of the recording industry. In electronic music, perhaps we need to admit that it’s okay to release a track under your name that features the work of others. And perhaps this cult of secrecy surrounding the invisible contributors on many dance music records needs to be finally blown open. It’s time we took the stigma out of working with engineers and producers. Rather than hiding the input of ghost producers, full disclosure should be practiced by artists, DJs, producers and labels alike to ensure that credit really is applied to where credit is due.